The annual tradition of decorating the Christmas tree is one of creating memories and strengthening family bonds. Along with the unique ornaments added to your collection each year, this ritual helps the ties that bind us to grow more beautiful. 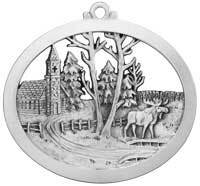 Every Christmas season at Hampshire Pewter, we are warmed by the stories of these traditions as shared by our customers. As they choose their special ornaments that represent some significance in their lives, we learn about their family and what makes Christmas special for them. One mom told us how every year she and her young daughters plan an outing to each select a new ornament. When it comes time to decorate the tree, they reminisce about how their choices in years past represented their place in life at the time. With this tradition, the girls are not only building memories, but a keepsake collection they will one day take with them as they begin a family of their own. We thought that was extra special. Some of our customer's selections mark a significant event, such as the Baby's First Christmas ornament. Some ornaments are chosen to symbolize favorite things, like pet ornaments, snowman ornaments or traditional Santa Claus ornaments. 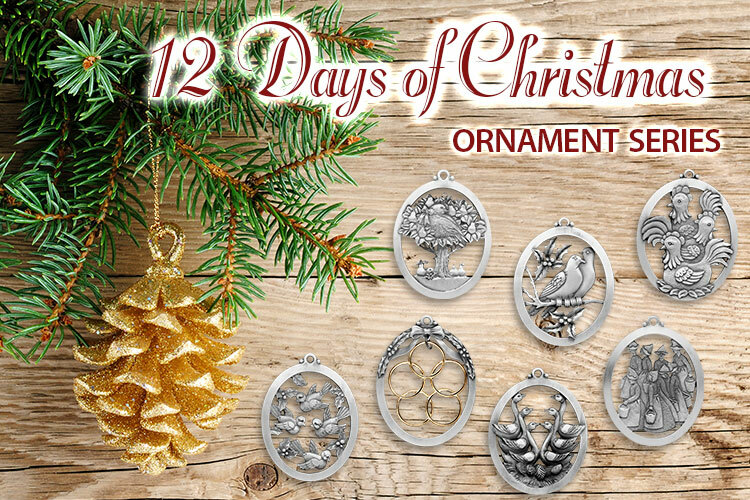 We have such a wide range of pewter Christmas ornaments to choose from, everyone finds that certain perfect symbol for their tree, as if it were made especially for them. We also engrave Christmas ornaments. 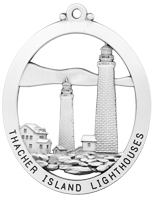 Most of our ornaments can be personalized on the top and bottom of the front rim, and on some ornament designs, additional engraving can be done on the back of the top rim. We most often get requests to engrave a name and year the ornament was given. Engraving can be requested online or in-store. 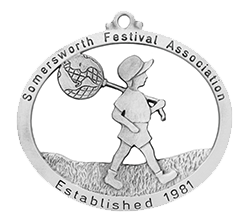 All our engraving is done at our flagship Somersworth, NH store, so for purchases made at our Wolfeboro gift shop, we send them to Somersworth and usually get them back to the Wolfeboro shop for customer pick-up within a few days. For ornaments that cannot be engraved, we offer the Engravable Bow Hanger. Each of our ornaments comes packaged in a pretty gift box with a ribbon to hang it on the tree. 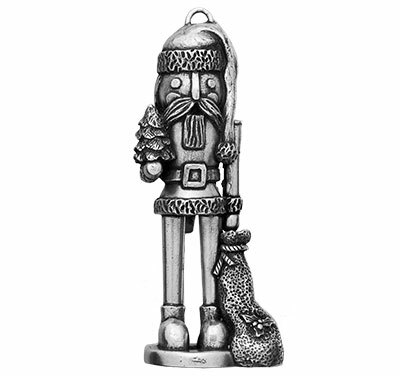 The favorite, by far, in our pewter ornament selection is the Hampshire Pewter 12 Days of Christmas Ornament Series. This series depicts the beloved Yuletide carol that has been sung by young and old alike for centuries. For the last seven years, we have regularly released new additions in the series and our loyal customers await each new release with much anticipation. Cast in the soft luminescence of light, no other ornament on your tree will look quite as elegant as a pewter ornament. Naturally, the first in this series to be released was a Partridge in a Pear Tree back in 2008. Two Turtle Doves was then issued the next year in 2009. Three French Hens followed in 2010. In 2011, we brought you Four Calling Birds. The next addition came in 2012 with Five Golden Rings. Six Geese A Layin' was introduced in 2013. Seven Swans A Swimming followed in 2014. For 2015, our latest release, we introduced Eight Maids A Milkin'. 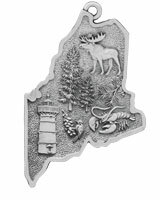 Build a tradition this year and own each piece in the Hampshire Pewter 12 Days of Christmas Ornament Series. Keep it as a treasured family heirloom collection or present it as lovely gift for that special someone or perhaps to the newlyweds as a tradition to build on.